In1901 Inventor Arthur H. Pitney patents his first “postage stamp device.” The invention promises increased office efficiency. In1908 Entrepreneur Walter H. Bowes incorporates the Universal Stamping Machine Company to sell canceling machines to the Post Office. The firm Pitney Bowes is still one of the of the big firms in machine cancel machines. Type PB2 Kojimachi UchiSaiwacho? 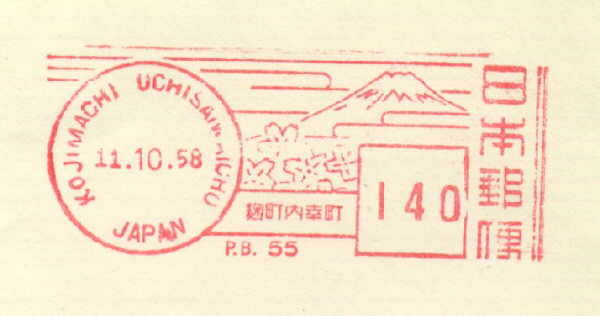 Japan 11/10 -1958 maskine PB 55 140 yen. Type PB41 Tokyo Nippon 13/7-1984 maskine PB 8589A 170 yen. Reklame for Maersk line. 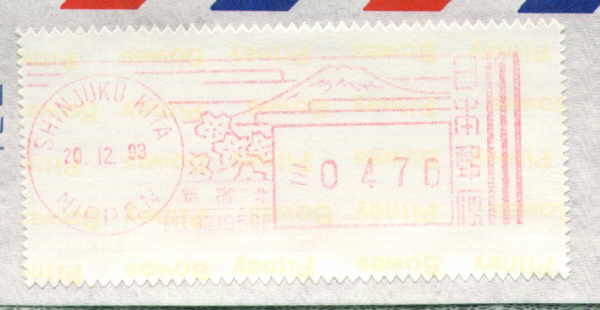 Type PB43 Akasaka Nippon 27/1-1995 maskine PB 00375E 80 yen. Type PB50 Kyoto Hyakumanden Nippon 18/8 1998 maskine PB 310503 110 yen. Copyright(c) 2004 SSJP Anker Nielsen. All rights reserved.